Let the count down to July begin. Finally, the long awaited collaboration between Eminem and Busta Rhymes has arrived. The track samples House Of Pain's 'Jump Around' as Busta spits rhymes over the beat, with Eminem coming in suggesting "Shady for President." Along with the full-length version of the song, the pair have dropped an official trailer for the song's forthcoming music video. Catch it above. 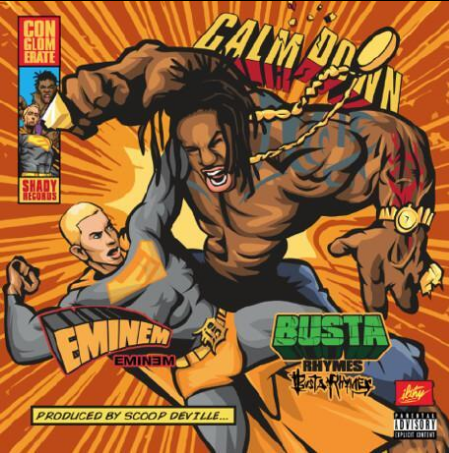 It sees Busta and Slim Shady depicted as comic book characters, with Eminem in a superman type costume, wrestling with his collaborator. Keep your eyes peeled and ears open - the single will arrive tomorrow. Busta Rhymes has taken to Twitter to announce that he has a new collaboration with Eminem coming soon. The two rappers have hooked up for new song titled 'Calm Down' due to drop on 1st July. Pictured in the studio together, Busta tweeted telling fans "It's official."